All in all I really love blogging more every day and every post. I hope Loqi and I can continue to do this for a long time and hopefully you'll enjoy it as much as we do! Thanks for the love and support through comments, e-mails and every other way you made this blog to what it became. 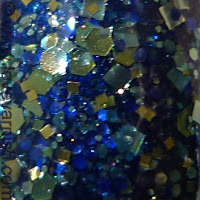 Now for the gorgeous polishes (that's what you came to see right?!). All swatches are made with Essence Peel Off basecoat, the color build up alone on the indexfinger, 2 coats over a basecolor on the middle finger, 1 coat over a basecolor on the ringfinger. Topcoat is 1 coat of Gelous and 1 coat of Essence Better Than Gel Top Sealer. I will only mention the amounts of layers used for the colors themselves. First up is HARE King Of Carat Flowers. The description by HARE itself says: "This is a light-medium grey jelly packed full of a mixture of gold and lilac glitter in both hexes and squares. 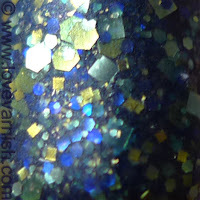 Mysterious iridescent blue glitter is scattered throughout, as well as delicate gold flecks.". From index to ring I used the following: 2 coats of HARE King Of Carat Flowers alone, 2 coats over Essence Grey-t To Be Here, 1 coat over Essence Grey-t To Be Here. I should have done 3 coats of this one by itself and it would have been more opaque, but for this color a bit VNL doesn't bother me too much. Application wasn't bad, I didn't have to dab really (but it wasn't dab free either), but you do have to be a bit careful with glitter clumping together. 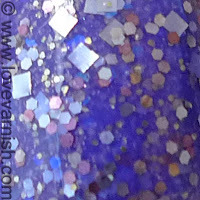 It is really filled up with glitter, and if you take too much on the brush you'll end up with fat tips and no glitter at the base of the nail. Next is HARE Amethystos. 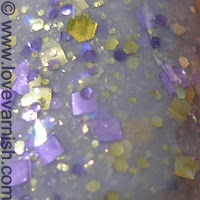 The description by HARE itself says: "This is a bit of a glitterbomb in a bright purple jelly! This shade of purple is my favorite color, which is why you are seeing it twice this Fall! This is a mixture of silver glitter in hexes and squares, plus pink and champagne gold glitters in several sizes. 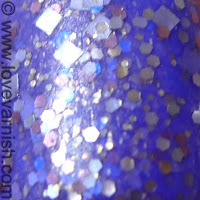 Amethystos also has the magical blue irridescent glitter and delicate gold flecks.". From index to ring I used the following: 3 coats of HARE Amethystos alone, 2 coats over Barry M Prickly Pear, 1 coat over Barry M Prickly Pear. There wasn't VNL with 3 coats by itself. The basecolor I used really changed the base color from a darker dustier type of purple, to a more bright and violet color. Application was good, no clumping and I didn't have to be careful while applying, it was just easy polishing. 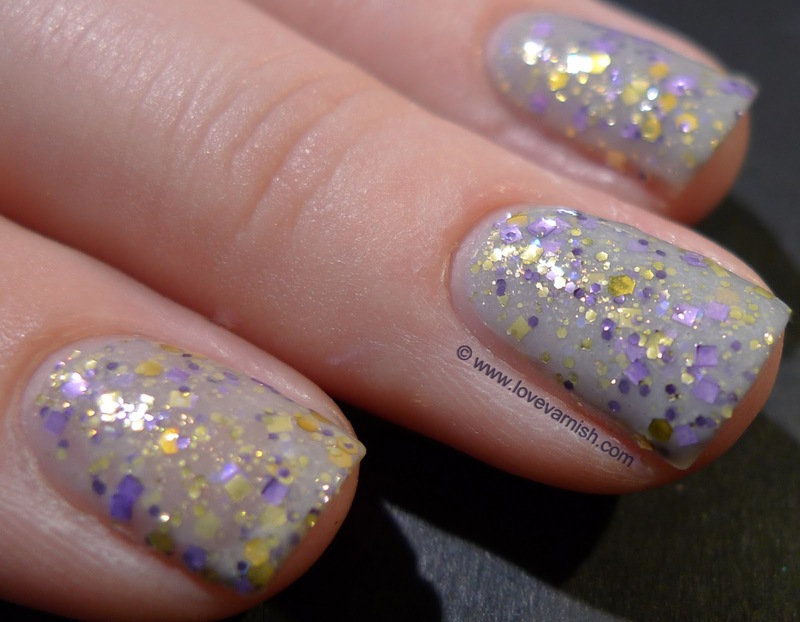 Only thing that could happen is that when you layer it, with just 1 coat the base can look patchy. But more coats means more glitter so that's always the solution! And the last one, my favorite, HARE Golden Years ♥. The minute I saw pictures of this one I knew I needed it. 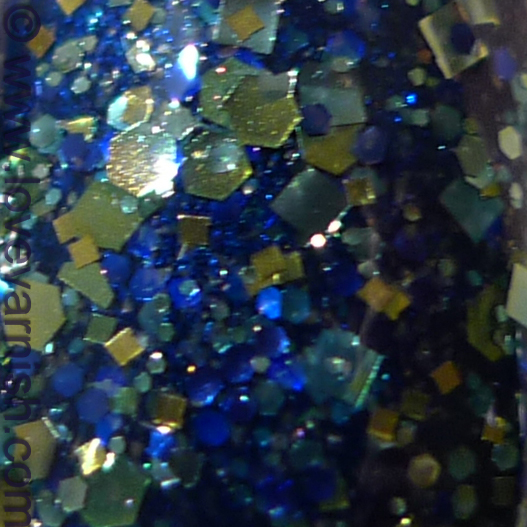 When Nikole said she'd send me samples, and that she might even include some of the new polishes, I was hoping so badly this would be one of them. It was. Epic moment was epic. The description for this one by HARE itself: "Golden Years is a semi-sheer navy blue jelly packed full of gold glitter in squares and hexes in all kinds of sizes, mysterious iridescent blue glitter, navy blue hexes and delicate gold flecks.". From index to ring I used the following: 3 coats of HARE Golden Years alone, 2 coats over Catrice George Blueney, 1 coat over George Blueney. There still was VNL with 3 coats by itself. Even though I love the murky touch to the base, wearing this by itself isn't opaque enough for my taste. Luckily when you use 2 coats over a basecolor it still has that jelly feeling to it. Application was great with this one, not even the slightest risk at clumping. Also the layering combo I made was an almost exact match to the tint of the base itself, so no patchy color with just 1 coat layered. I love it best with 2 coats though! 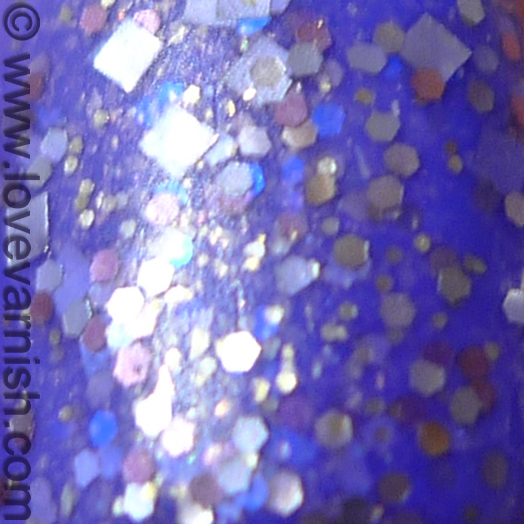 HARE polish can be bought through Nikole's Etsy shop, polishes are $10 per bottle. She ships international. 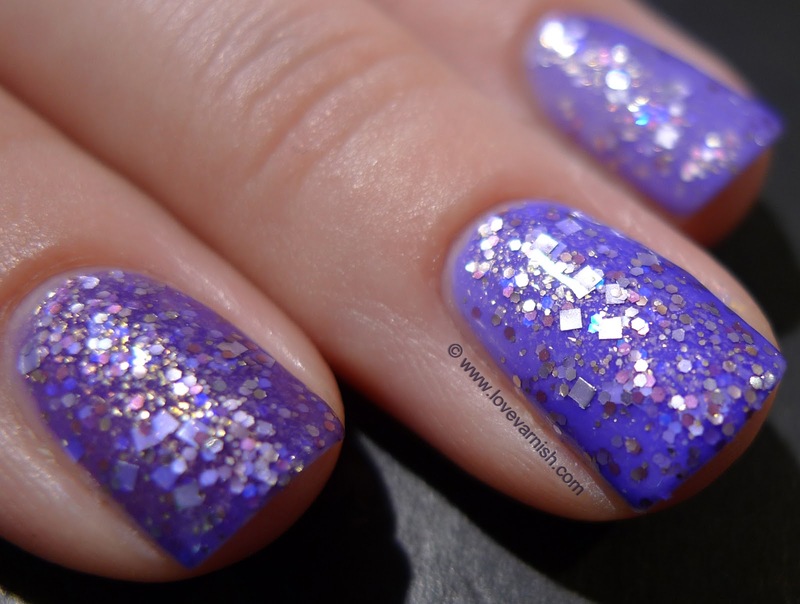 You can also find HARE polish at Llarowe, for $11 per bottle. 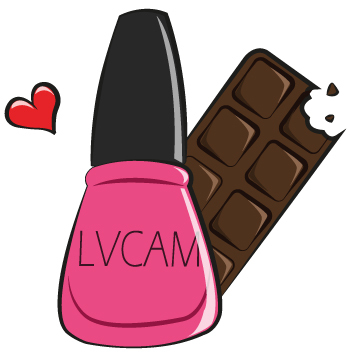 Llarowe also ships international. You can also find information about the collections on the HARE website and Facebook page! I love HARE polish!! These are fab!! First off, King of Carat Flowers and Amethystos are right up my alley! They look awesome! Also happy anniversary! You deserve every follower you have got! You have one of my favorite blogs, and you area always so sweet! *drool* King Of Carat Flowers is GORGEOUS!!! Congrats! :) These polishes are all beautiful, especially King of Carat Flowers. Congratulations on all the fantastic stats! I hope you have many more blogging years left! I love Hare - The Golden Years - it's so beautiful! Good luck for the blogging future! My fav indie brand! :D These look stunning! That last one.. omg. They all look great on you! And Happy Blogiversary! Thanks so much Elizabeth! And yes, they seemed so fitting for the anniversary . They really are so so pretty ♥ musthaves I'd say. And thanks so much for your kind words Angie, it really touches me! King of Carat Flowers is very very unique! Thanks! It's funny how I didn't except it to be the most coveted but it seems everyone is going for King of Carat Flowers! Thanks Stephanie! Just make sure it stays fun and doesn't become this "obsession" and you'll do finj :). Thanks, we hope so too! I couldn't imagine my life without the blog. 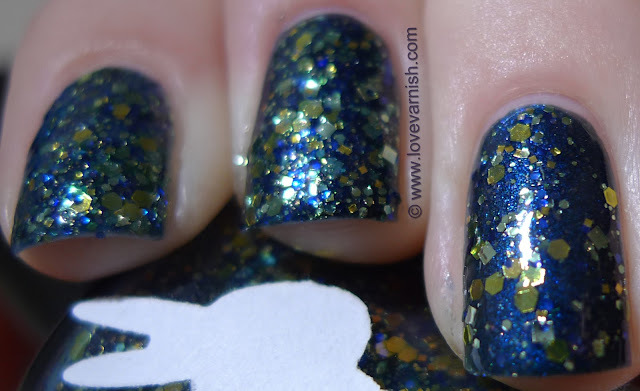 Yes it's my fav' too, the contrast between navy and gold is just so dreamy. Yay for HARE ♥! And thanks babe! *blushing* that's really sweet of you to say Kristine! Thanks Stef, I can imagine that last one on you totally! And thanks :)! Love this post. And Hare King of Carat Flowers is really gorgeous! !